Adrian Egolf (Donor Relations Manager, Ensemble Member) appeared as Marie Antoinette in BETC’s The Revolutionists, Roxanne in Cyrano, and Young Alma in Ambition Facing West. Locally, Adrian has worked with The Denver Center for the Performing Arts, the Arvada Center, Colorado Shakespeare Festival, Colorado Symphony, The Barth Hotel, Colorado Springs Fine Arts Center, The Edge Theater, Creede Repertory Theater, The Denver Children’s Theater, Theatreworks, Miner’s Alley Playhouse, and Curious Theater Company. Regionally, her credits include: The Eugene O’Neill Theater Center, Off Square Theater Company, and The St. Petersburg Arts Academy in Russia. Adrian received her training at The National Theater Institute and from being in good company! 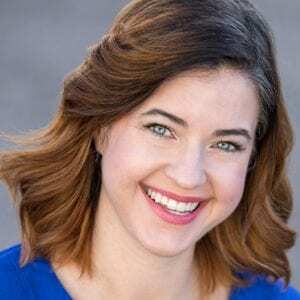 She also runs her own theater company, ScreenPLAY, which raises money for arts-based non-profits in Colorado with staged readings of movie favorites.